The aspirants who are willing to have the post can simply apply for the examination. The Commission has earlier notified the applicants regarding the exam to be conducted. This year also the Commission has released the notification of the NDA/NA II Exam 2015 and has invited the aspirants. It is a big dream of some of the aspirants to clear the said test. 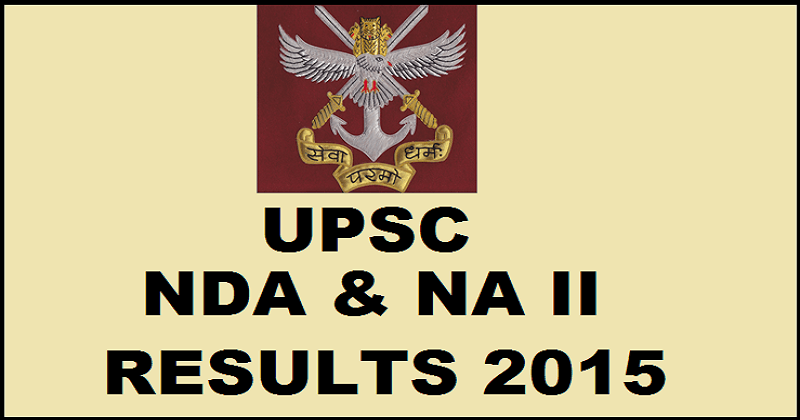 Candidates applied online in large numbers for the National Defence Academy (NDA) and Naval Academy (NA) Exam (II).The interested and eligible aspirants had applied and successfully written the exam that was held as scheduled on 27th September 2015. The results were declared, and the qualified candidates have appeared for the interview. The candidates who have applied for the examination were in a high state of panic about the result of the interview round. Later the interview results were out. A total of 423 candidates were qualified in the interview. It is quite obvious that the candidates would have been waiting so long for the final mark, and now their wait has come to an end as now the commission has made the final marks of the candidates available on the website. The qualified candidates of the interview round can check the result on the website. The Commission has prepared the list based on the merit. It has displayed the marks of written test and the interview of the candidates in the result. The Selected applicants will be admitted to the Army, Navy, and Air Force wings of the NDA for the 136th Course, and for the 98th Indian Naval Academy Course (INAC) scheduled to commence on 02 July 2016. Visit the official website. http://www.upsc.gov.in/. The list of the selected candidates marks will be displayed on the screen. Download it or take a printout for future purposes.